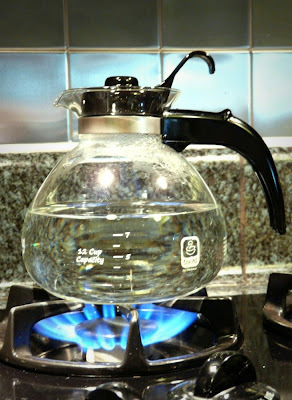 This kettle is called the Medelco 12-cup Glass Stovetop Whistling Kettle (available on Amazon at this link) and this little marvel works on both gas and electric stovetops. It sure does whistle and the handle and lid, amazingly, does not get too hot to handle. 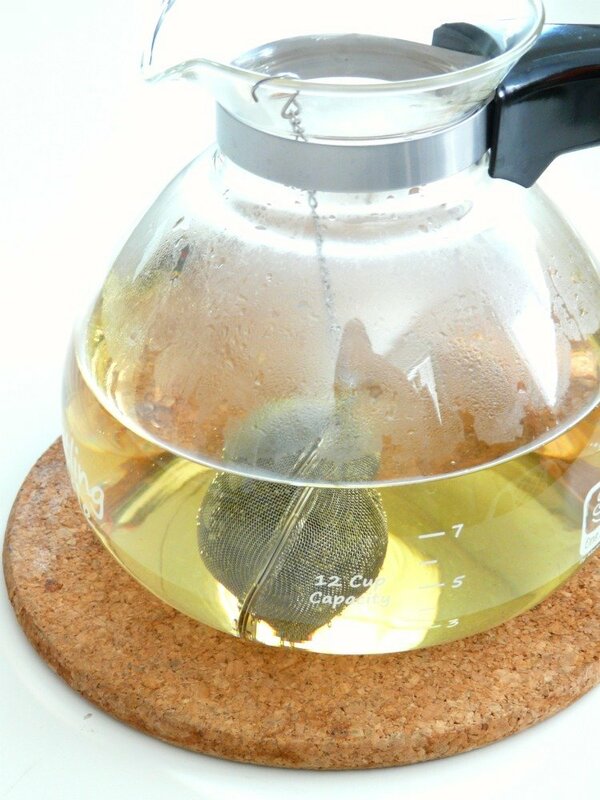 I purchased a stainless steel tea mesh ball also and with this combo, I can now do away with my old teapot as well. After the water boils, I pop in the mesh ball with my tea leaves, hang it on the side of the kettle and let it steep until it's ready. 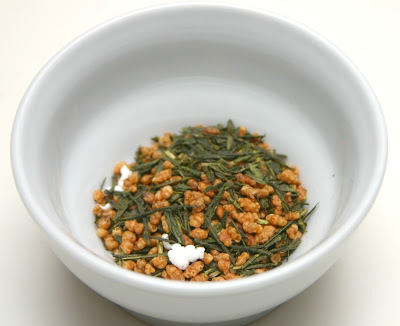 My tea of choice is usually genmaicha (brown rice tea). It has a mix of roasted brown rice and tea leaves and imparts a fragrant, nutty aroma and flavor. 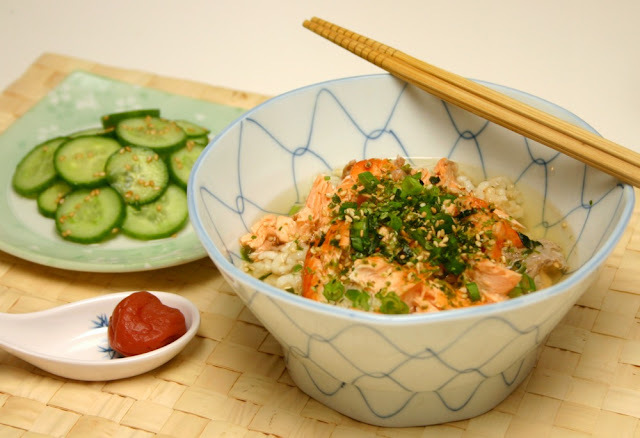 Since I've been drinking so much tea, I decided to also make salmon Ochazuke for an easy dinner. Ochazuke is a dish in which hot tea is poured over rice and eaten with various toppings. It makes for a light meal or snack and is filling and healthy at the same time. 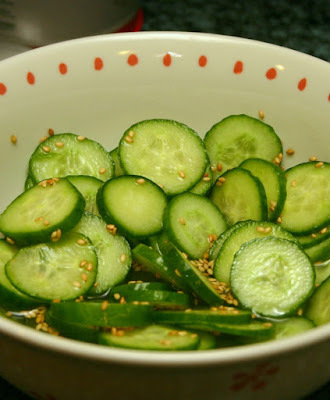 For added crunch, I served it with a refreshing Japanese cucumber salad and dinner was served in about 20 minutes flat. Weight Watcher PointsPlus per serving: 1 pt. Make this quick cucumber salad and allow it to marinate and chill in the fridge while you prepare the salmon. 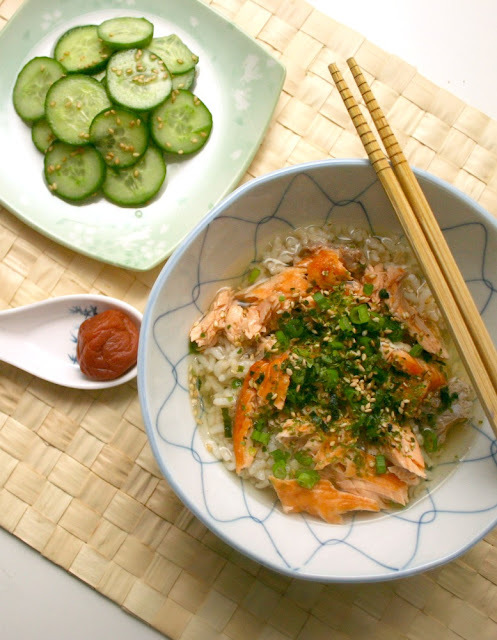 In a bowl, whisk the vinegar, sugar, salt and sesame seeds together. Add the cucumber slices and toss to coat. 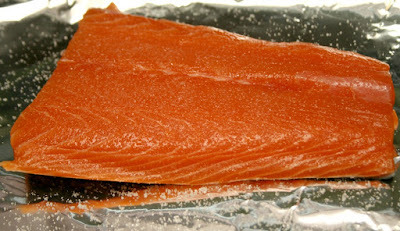 Cover and allow to chill and marinate in the fridge for at least 30 minutes or until ready to serve. Weight Watcher PointsPlus per serving (based on 1/2 cup rice and 3 oz. salmon): 7 pts. Wash the salmon fillet and pat dry with paper towels. 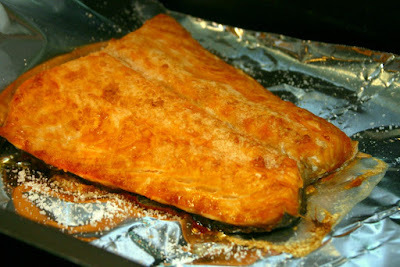 Place it skin side down on a baking sheet lined with foil. Salt the top of the fillet generously with sea salt. Broil the salmon fillet for about 10 minutes until the top is browned. 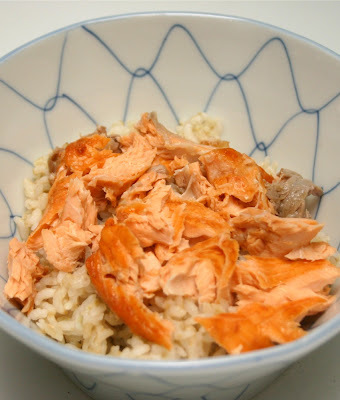 Place a 1/2 cup of brown rice in a bowl and top with shredded salmon. It should flake easily. 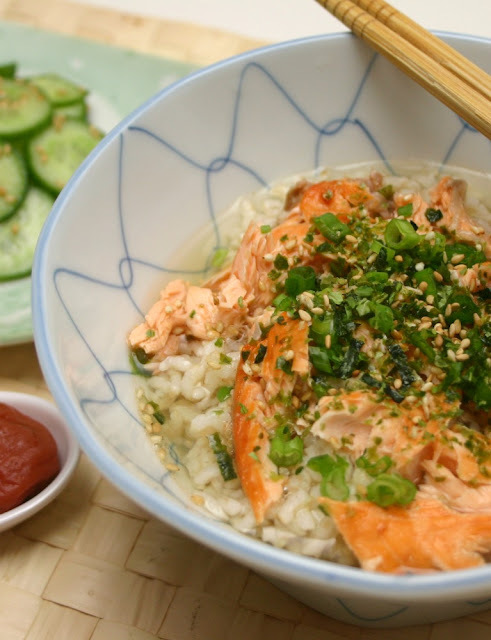 Pour about 1/2 cup of tea over the rice and salmon and garnish with your toppings of choice. Serve with the chilled cucumber salad.